An appliqued asymmetric overlay of embroidered tulle ornaments the bodice with a jacquard knit skirt. Highlights include sheer long sleeves, a hand cut neckline, and a sweeping train. Peonies are outlined in metallic silver cording and cover the three quarter length sleeves. The long elegant skirt is both chic and comfortable. Cap sleeve short dress covered in blossom-motifs. Neckline and hem are finished with lace trim. Tea-length dress with pleated sheer illusion sweetheart neckline sewn with delicate lace trims. Finished with lace inserts and lined with jersey. Crafted from exquisite corded embroidery on tulle, this cocktail dress is at once elegant and lovely. The timeless bateau neckline is balanced by a flattering back v-neck, while sheer 3/4 sleeves and an alluring illusion neckline top off this feminine look. 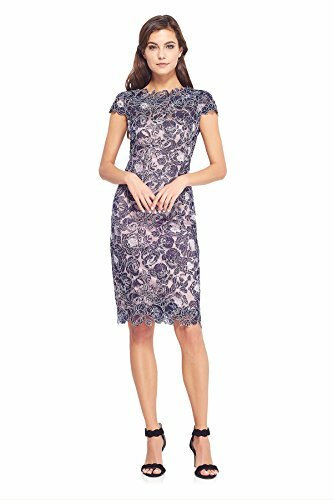 Compare prices on Tadashi Shoji Dresses at ShoppinGent.com – use promo codes and coupons for best offers and deals. Start smart buying with ShoppinGent.com right now and choose your golden price on every purchase.